Our organization is involved in manufacturing and exporting a wide range of Crane Component. We manufacture this products with advanced steels sourced from foremost mines around the world. These are highly preferred for building strong cranes. All the products listed under this category are Wheel Assembly, DSL Systems, Rail Clamping Systems, Crane Buffers, Overloading Safety Switch, Cable Trolleys, EOT Crane Control Panel, Flat Cables, DSL System, Four Pole Hanger, Current Collector and Expansion Joint. 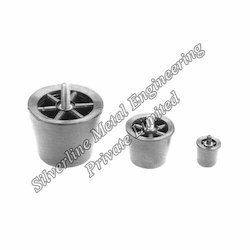 We are leading manufacturer of Hook Pulley Block Assembly. These wheels are made from cast iron or forged EN 8 material . 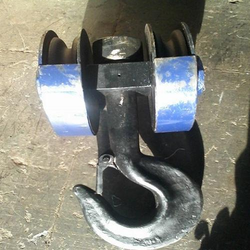 The hooks are manufactured by forging with EN 8 / EN 9 material. These are supplied with test certificate. Our expert team allows us to manufacture, distribute and supply leading products of Wheel Assembly. We use good equipment and machineries for the manufacturing of our renowned products. These are manufactured using excellent steel and alloy materials procured from genuine vendors. 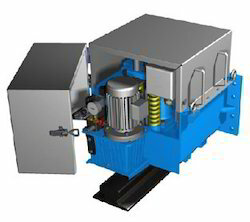 The salient features of our product are long durability, damper proof, easy rotatable and high load capacity. These are in great appliance in industries and lathes. 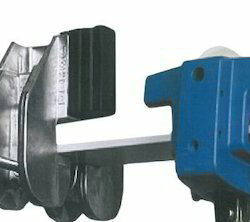 Hydraulic Rail Gripper is a product widely used for looking the position of crane. Lot of accidents happen due to crane being moved by wind pressure and cause substantial damage to crane as well as other equipments if crane is left on rails without proper breaks can slide till end and fall down. This grippers are available in various capacities. This is a must for all crane located close to seafaces. Our expert team allows us to manufacture, trade, supply and export leading products of End Carriage. We manufacture these products using top quality alloys and steel materials sourced from genuine dealers around the globe. These are featured with amazing designs, blue color outer polish and rust free make. All our products can be placed in small and large scale industries for heavy load handling functions. 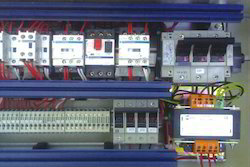 Control Panel For EOT Crane is suitable for two speed motors well as for VVVF drive can be manufactured as per customer’s designs. 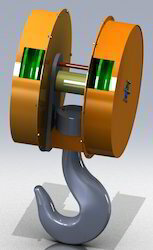 We provide Drive Wheel Assembly to our clients. We are leading manufacturer of Hook Block Assembly. These wheels are made from cast iron or forged EN 8 material . We are a trustworthy organization in offering a wide gamut of Mega Trolley (For Heavy Cables). 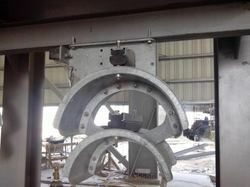 We have designed a fabricated I Beam Stopper for restricting the movement of Hoist. It is easy to remove and fix on different locations which helps easy removable of for the purpose of maintenance without trying to remove wheels of hoist trolley. We hold the expertise in manufacturing, trading and exporting Crane Buffers around the globe. Our products are manufactured using first-grade steel and raw metals purchased from trust-worthy vendors. The entire products of us are featured with a sturdy structure, paramount durability and strong central axis bar. These are mostly preferred in all industrial places, automobiles and lathes.